Oh Canada…..every tone in which those two words can be spoken was expressed this weekend on the river in Montreal. Remember that race in Canada where Rosberg nearly hit the wall after leaving the pits? And he maybe could’ve got a penalty for cutting the chicane when Hamilton was behind him? And Mercedes finished one and two and the drivers smiled at each other through gritted teeth? This is the race we nearly ended up watching on Sunday: another mildly interesting battle between Hamilton and Rosberg that becomes bigger in the media and ruins friendships, apparently. Well forget that race. Canada delivered something much more invigorating and intriguing in a season where things were starting to stagnate a little. First let’s talk about the extra-circulars. The early news of the weekend was Adrian Newey extended his contract at Red Bull, but in a role that means he’ll probably have more time to design around the world yachts. This deal strikes me as a move by Red Bull to keep Newey out of the Tifosi’s clutches and the cost of that is that Newey wants more time away from F1. But for the foreseeable future Adrian will oversee the development of the next generation of Red Bull cars. 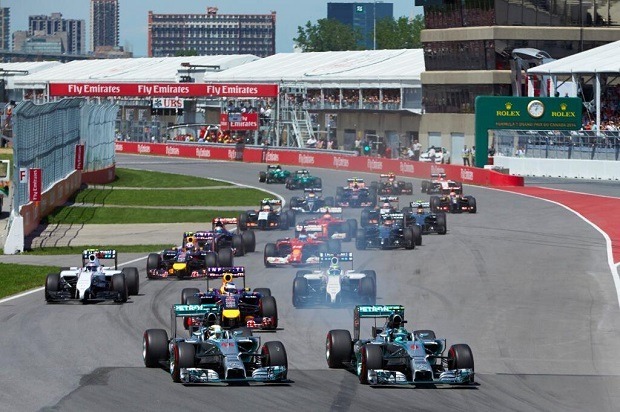 Secondly, before the race it was announced that the hosts of the Canadian GP signed a 10 year deal for the Montreal racetrack, with the caveat that the stands and pit lane receive major upgrades over the next year. All things considered this is the best news all weekend. This is one of the most beloved tracks on the calendar and with new money venues like Sochi and Baku (no one knows what Baku’s track will even look like yet) entering the calendar, its good to see some of the classic tracks being given extensions as well. Now that’s the paperwork sorted let’s get to the race. All the cars just about banged and scraped through the first two corners without major incident but in turns 3 & 4 Chilton and Bianchi collided resulting in a shower of carbon fiber and brought out the safety car. Initially the accident looked like Chilton’s fault as he seemed to carry too much speed into the corner. But the more I see it the more I lean towards it being a racing incident. The Marussia is one of the most unstable cars on the grid and with cold tyres and brakes once Chilton began to lose the car there was no getting it back. The crash however had big implications for the rest of the field as the safety car came out for seven laps meaning fuel saving was no longer a consideration for most of the teams. The first round of pit stops came and went around lap 19 for the two stoppers. The only real loser here was Massa who had a slow pitstop which dropped him into traffic. In hindsight this could have changed the way the race shook out in the end but it is such a minor detail in a much bigger picture. Lap 25 and Rosberg locks up his front left tyre and drives straight over the final chicane gaining a small amount of time. He was warned for cutting corners but no further action was taken. As the race developed it looked like we were in for another massive punch up between Rosberg and Hamilton, and for most of the race that’s what we got. It was a very close battle up until one of the most peculiar moments of the season so far; both Mercs developed permanent failures of electric motors in the power units on lap 37. Of course F1 has always had failures and technical problems but this is a real appeal for information on any other incident like this, because I can’t think of one. The failure of the electric motor, or ERS system, meant both Mercedes drivers were down on 160bhp leaving them with wet powder as the rest of the field chased them. With this failure they were also putting more pressure on their rear brakes. On lap 46, it would prove too much for Hamilton’s car and his brakes failed as he tried to overtake Rosberg on the back straight, ending his race. While this was going on Ricciardo had managed to jump Vettel during the second round of pit stops. And, somewhat miraculously, Perez managed to stretch his supersoft tyres to lap 35! He rejoined in tenth on the Prime tyres and wouldn’t stop again. On lap 48 Massa pitted and rejoins behind his teammate who was being held up by Hulkenberg. Both Force India cars were very fast on the straight which allowed them both to maintain track position on older tyres long into the race. On lap 50 it was Perez, Ricciardo and Vettel who began to chase down Rosberg who was struggling on the straights and having to manage his brakes to avoid a failure. Five laps later the top four were covered by less than two seconds. Perez was unable to keep up with Rosberg through sectors one and two leaving him too far back to effectively use his DRS to pass. Lap 57 and Massa, down in 8th, capitalizes on a mistake by his teammate in the harpin and gets a great drive out of the corner to finally get passed Hulkenberg and begin chasing down the leading pack. The race proper began here and with Massa going fastest on track he caught up to the back of Vettel in 6 laps. The top 5 were now covered by two seconds, with Massa looking to have the upper hand with tyres that were 10 laps newer. On lap 64 Massa draws alongside Vettel on the back straight trying to go around the outside into the final corner. Massa’s DRS didn’t open however and he wasn’t able to get ahead of Vettel into the corner. If Massa had a chance to win the race I believe this was it. 4 laps to go and Ricciardo bravely goes around the outside of Perez into turn one, makes the move stick into turn 2 and set his sights on the limping Rosberg. Perez at this point is having electrical problems and braking issues, complaining he couldn’t go after Ricciardo because he had no rear brakes. 2 laps to go and Ricciardo easily passes Rosberg along the straight for lead of the race to the delight of much of the crowd. Vettel gets a DRS pass on Perez into the final turn allowing the reigning champion to finally get by and into third place. 2. because he had a brake issue. Massa was caught out by Perez braking early and smashed into the back of him sending both cars into the barriers very heavily. After the race Perez would receive a 5-place grid penalty for causing the crash. Luckily both men were medically cleared shortly after the race. Vettel was the luckiest man of the day as he was handed third place and didn’t have his head taken off by Massa’s out of control Williams. 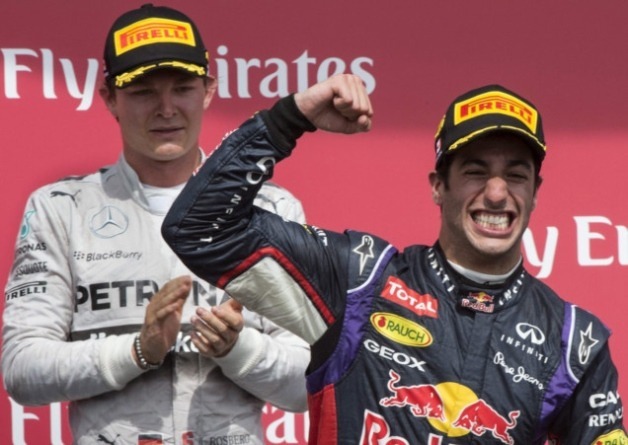 The Safety car emerged to clear the accident and Ricciardo claimed his first win and Red Bull’s first of the season. He was clearly delighted and rushing with adrenaline on the podium. Vettel who was lucky at the end but drove a great race. Perez who managed his strategy to perfection and in the end was let down by his car. Massa who drove a great race fighting his way through, he was unlucky with pit stops and in the incident with Perez. And we can’t forget Button (4th) or Hulkenberg (5th) who brought their cars into excellent points scoring positions. But the real question here is Nico and Daniel, now I’m a fan of Ricciardo, cause who isn’t. But despite his great driving all race it was a massive task for Nico, who all race had to deal with Lewis, the loss of power, the braking issue and finally to keep a train of three-to-four behind him for the latter third of the race. To get his car across the line in second is a champions drive, sure the crash at the end meant Vettel couldn’t catch him but even so I think he did all he could do. In the end the race was huge for Rosberg for the right reasons, huge for Hamilton for the wrong reason, and massive for Red Bull ahead of their home Grand Prix in Austria in a few weeks time and the rest of their season.